minimal invasive (nondestructive) CARS method for biological samples. Due to the high sensitivity of CARS method molecules in living cells can be detected without fluorescent markers. 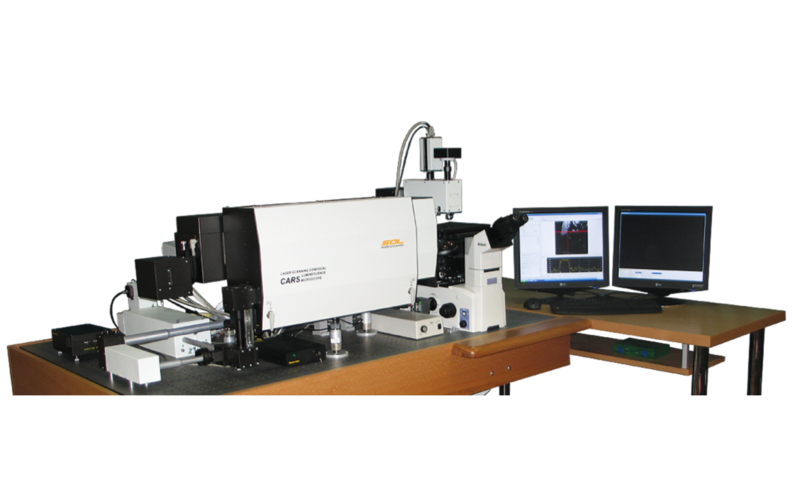 Highly-precise calibration over the wavelengths: better than ±0,002nm due to an embedded calibration lamp as a source of reference lines for automated operative calibration of the monochromator-spectrograph. Block, rigid framing provides a high temporal and thermal stability. Selective imaging of MIA-PaCa pancreatic human cancer cell for resonance 2845 cm -1 C-H bound (C-H aliphatic stretch). Selective lipids visualization. All-round automation : measuring modes switching by automated switching of the components inside the system; control over the shutters for wavelength selection of the excitation laser; control over the polarization in the excitation/registration channel; selection of a grating, setting of a central wavelength and selection of an output port of the monochromator-spectrograph, adjustment of a pinhole position , etc. - mathematics operations: addition, subtraction, division, multiplication ,etc. All components of the system based on the optical plate with the pneumatic vibrated insulating legs.